In early April, 1945, the 3rd Canadian Infantry Division was given the task of advancing north from the Rhine River, along the east bank of the Ijssel River, to reach the north Sea, cutting off the German forces in the western Netherlands. One of the last major points of resistance along this route was the town of Zwolle, the last bastion of the German's Ijssel Line. As preparations were being made for a co-ordinated attack, a request went out for volunteers to make a night patrol into the town. Private Léo Major and Corporal Wilfrid Arsenault of Le Régiment de la Chaudière answered this call. At about 2300 hours on April 13, the two scouts attempted to slip into the suburbs but encountered a German patrol which resulted in the death of Corporal Arsenault. Despite this, Private Major decided to carry on with his mission, carrying two Sten guns and a sack of grenades. At about 0100 hours, he arrived in the centre of Zwolle and found the streets deserted. He then came across a German machine-gun nest in which the crew was sleeping, so he attacked and wiped it out. He then found a German scout car and forced one of the Germans who he had captured to drive through the streets with the lights on, flying a white flag. For several hours, Major moved through the streets in this manner, shooting at any target he could find, making an impression that a large Canadian force had arrived. The citizens were awakened but were afraid to come out of their houses. By a stroke of luck, Private Major came across the head of the local resistance and three of his men. By now the Germans appeared to have fled the city in panic. The group therefore returned to the town hall and the resistance fighters brought the citizens out into the streets. The local radio station was then used to announce to the townspeople that they had been liberated. Major was exhausted but he had to complete his mission by bringing back the body of his comrade, Corporal Arsenault. The resistance fighters arranged for a car to transport the body back, but it was fired on by outposts of his battalion. Major was furious and climbed onto the top of the car so that he could be easily seen from a distance. In this manner, he returned to the Canadian lines to report the result of his mission to his Commanding Officer. 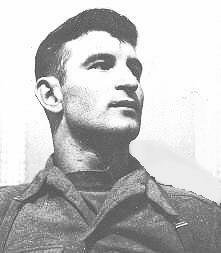 For his actions this day, Private Léo Major was awarded the Distinguished Conduct Medal.